Register Log In GliderCENTRAL Forums HELP! I'M NEW... Soon to be Sugar Daddy! Hi, my name is Ryan. I will be getting my fuzzbutts in a couple of weeks and can hardly wait. I've been researching for a couple of months on diets, behaviors, toys, etc. I know I have more to learn, but I'm pretty sure that I have the necessities down. I will be getting two creaminos (male and female), whom I lovingly named Pebbles and Bamm-Bamm. I just can't wait to get them home to start the bonding process. I am a fact checker, and that drives my fiance nuts. I am also a dog person but had to put my bud down 7 years ago and just couldn't get anything else to take his place. Until now! I am a pretty out going person for the most part, easy to get along with. I have the patience of a rock. I can take a lot before I break. Just a quick introduction basically. 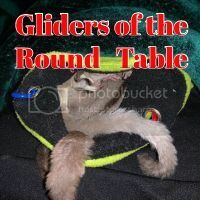 I look forward to taking part of the glider festivities! There no such thing as a dumb one. Oh and please share pics once they calm down. We love baby pics! Make that any pictures Welcome!!! Hi Ryan, and hello from the Lone Star State as well. I'm in Dallas and I'm mommy to 5 sugar boogers. Thank you all for the warm welcomes! I will post pictures as soon as I can get them in their mansion and they get settled! I will be getting their food made this weekend so I can get it in the freezer and ready to go! So I've had Pebbles and Bamm-Bamm for a week now. Pebbles is settling in good but Bamm-Bamm is a little shy still. I can see I will have to take things slower with him. So far I have been able to hand treat Pebbles with only a few nips here and there. Bamm-Bamm will sniff the treat then retreat back to his safe place and crab, so I just leave the treat to where he can see it and he eventually snags it when he thinks I'm not looking. Sneaky sneaky! I have their cage set up like a (fleece) jungle. Pebbles simply loves it. She runs and jumps all over the place like a little kid on a sugar high. Bamm-Bamm explores a tad, but has made progress. I haven't been able to get a good picture of them yet, but this should be a rough introduction. Will be fine tuning the set-up once they get a little easier to handle so I'm not having to stress them out by chasing them around the cage to pouch them. Last edited by Remmyt; 04/08/17 03:15 PM. Very nice looking gliders and their Diggs look great! Thank you for sharing pic's! It's normal for one to show more interstate than the other. It becomes a "Monkey see, monkey do" and the other will see you are safe by watching.